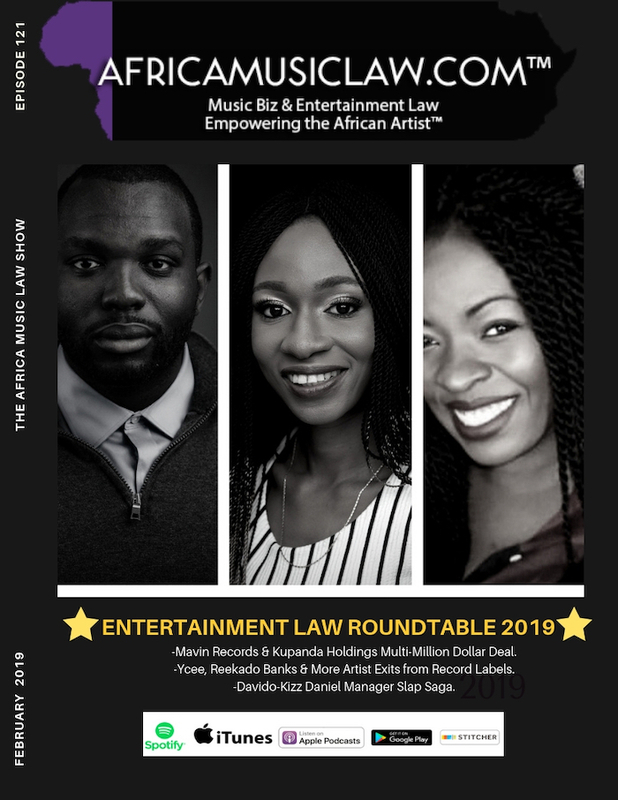 In the 121st episode of the Africa Music Law show, entertainment law roundtable guests discuss the latest multi-million dollar deal partnership between Mavin Records and Kupanda Holdings, Nigerian artists Ycee, and Reekado Banks leaving their record labels, and the infamous scoff between Davido and Kizz Daniel’s ex-manager. This is part two of a three-part entertainment law roundtable series focused on the African diaspora. The guests are entertainment lawyers Fozadoza, and Lydia Agu, and entertainment entrepreneur Eche Emole. 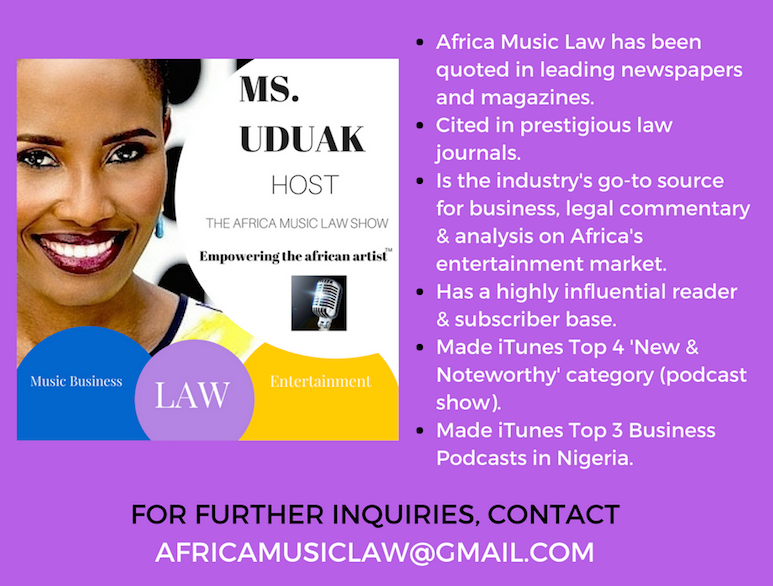 The host is Ms. Uduak, a Fashion and Entertainment lawyer, publisher, producer and host of The Africa Music Law Show. Listen to this Episode part 1 of the series here. Fawehinmi Oyinkansola is a founding partner at Legalbyte a boutique law firm servicing the creative industries in Nigeria. She heads the music, film and fashion portfolios of the firm. Oyinkansola popularly referred to as “Foza” has successfully pioneered the emergence of many revenue streams for a consortium of producers for the publishing of their catalogues. She also played a pivotal role in daily management and administration of The Sarz Academy; an NGO pioneered by Sarz (a top ranking music producer in Nigeria). Popularly known in the Telecommunications value added services, she has brokered many licensing and publishing deals for host of artists. Foza also doubles as a business manager for singer Chee. She can be reached via email (officialfoza@gmail.com) or on twitter: @fozadoza. Eche Emole is the Founder of Afropolitan Group, a leading live entertainment, and media company in the Bay Area, Northern California, that has produced live events headlined by Afrobeats stars like Mr. Eazi, Davido, Patoranking, Olamide, among others. He is also an executive at Flutterwave Inc., a payments technology company, headquartered in San Francisco and providing a platform (Rave) to make and accept payments from anywhere across the globe, including Africa. Eche holds a Juris Doctorate from U.C. Hastings College of the Law. He can be reached on Instagram via @afropolitangroup. Lydia Agu is a reputable attorney, women’s rights advocate, and writer. Though she has experience in various areas of law, Lydia is most noted for her keen knowledge of entertainment law and litigation work. In 2009, Lydia graduated from Fordham Law School and in 2011 she foundedThe Agu Firmin Manhattan, New York. As an entertainment attorney, Lydia has worked with renowned Afro-beats musicians, managed a record label for two years, and provided consulting services for various record labels and artists. 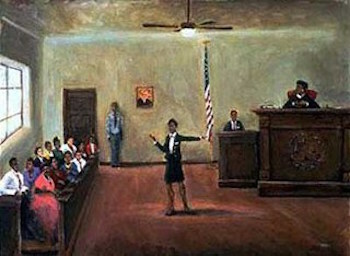 Lydia was also the first attorney to obtain a federal court injunction against an African artist, preventing him from performing in the United States. Lydia has a successful track record of suing various artists and entertainment companies on breach of contract cases, settling favorably on behalf of her clients. She has also successfully settled various sexual assault cases against individuals and big-name employers. Currently, Lydia is serving as the attorney representing Faith Rodgers against Robert Kelly (most notably known as R&B singer, R. Kelly). She can be reached on Instagram via @Lydiaaguesq. 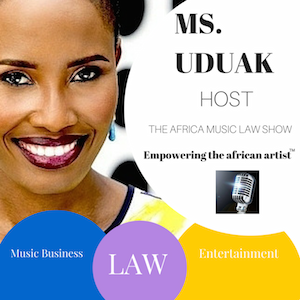 Uduak Oduok, (Moderator) founder of Africa Music Law, is a Partner and Co-Founder of Ebitu Law Group, P.C. where she handles her firm’s intellectual property law, media, business, fashion, and entertainment law practice areas. For fifteen years, as an attorney, she has litigated a wide variety of cases in California courts. She has also handled a variety of entertainment deals for clients in the USA, Africa and Asia including network television and licensing deals. Her work and contributions to the creative industry have been recognized by numerous organizations including the National Bar Association and featured in prestigious legal publications in the USA: ABA Journal and The California Lawyer Magazine. She can be reached via email (uduak@ebitulawgrp.com) or on twitter: @uduaklaw. Mavin Records & Kupanda Holdings Multi-Million Dollar Deal. Ycee, Reekado Banks & More Artist Exits from Record Labels. Davido v. Kizz Daniel Manager Slap Saga. Lydia Agu, Esq. | @Lydiaaguesq. Always a pleasure speaking with you! The best to do this! Thank you for having me!